Reader, meet asparagus. I know, I know. Asparagus is pretty controversial, as vegetables go. The internet loves to make fun of it for being expensive, can be "woody", and making your pee stink. But, while all those are true, I swear, it's got some great qualities once you get to know it! Asparagus is delicate, sweet, and super versatile. Kids love it's long funny shape (perfect for using as a sword! ), and it's great for toddlers to pick up with their hands and gnaw away. I did some deep digging into the world of the 'gus, read on to gain a new appreciation for this veggie, and hopefully add asparagus to your family's table! Most of us are familiar with the traditional green asparagus. But have you ever seen white, or PURPLE asparagus? White asparagus, I just learned, is actually the same variety as green asparagus. But when the plant is growing, farmers cover the stalks with soil so that no sun touches it. Without the sun shining directly on the plant, no green pigment develops, and the asparagus remains white. This extra effort makes white asparagus more expensive and more fragile, it needs to be eaten quicker than the green kind or it gets dried out and woody. It's also said to be more tender and nutty flavored, good for eating raw. But, because there is no color in the asparagus, that means it has less antioxidants than the other varieties. Purple asparagus is sweeter and more tender than the white or green varieties. It's color will fade when you cook it, so this type might be better used for eating raw or for a really quick cook. Honestly, the color is so beautiful I might just not be able to eat it at all! I searched all over my local markets for purple asparagus and still haven't come across it, so if you have, please comment and let me know how your experience was! Let's be honest, asparagus isn't the cheapest vegetable in the basket. But, it's pretty easy to see why. First, it takes several years after planting before the plants are ready to be harvested. That's a lot of time for the farmer sitting around and waiting for their investment to pay off. Also, the harvesting season is short, so supply is limited. And for white asparagus, there's all that extra work of covering the plants with dirt, and then cleaning all that dirt off again. All these things add up and make asparagus one of the pricier spring veggies. Choose thick or thin stalks depending on how you plan to cook. Choose thicker stalks for grilling or cooking in a pan over high heat. Choose thin stalks for eating raw or if you are planning to lightly cook them. Slice off the bottom part of the stalks where the color starts to fade and it looks like it's getting woody. Eat your asparagus ASAP, but if you need to store it, display them like a bunch of flowers in a vase with some water. Yep, it's a fact of life, asparagus makes your pee stink. 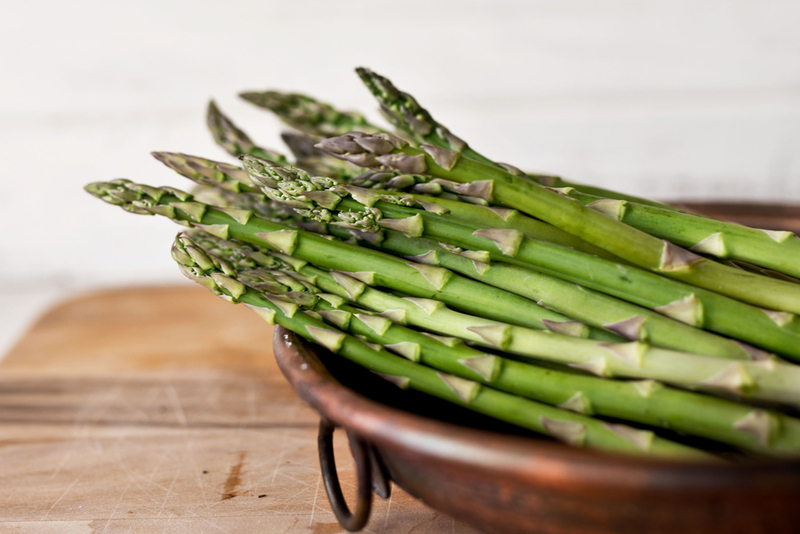 As asparagus is broken down in your body, it releases compounds that make it's way to your urine and release that wonderful odor that (most of us) know and hate. If you're one of the lucky ones, you can't smell it, but don't worry, your pee still stinks. It's fine. Get over it. No one else is smelling it but you (and maybe your little kids when they burst into the bathroom the second you thought you had some freedom). Think of it as a teaching tool for your kids: you ate the asparagus, now it's in your body building muscles and keeping you strong, and the way you know it's in your body is you smell it in your pee! It's all about perspective. Here's a roundup of some of my favorite recipes using asparagus. Asparagus is an incredibly easy vegetable to cook, requires very little prep, and works with a ton of different styles of cooking. Be sure to share your photos with me of your finished asparagus dishes! Share your tales of delicious asparagus recipes (or, even better, embarrassing asparagus pee moments)!